Yesterday, I walked the sprawling floor of the Consumer Electronics Show. These are the six key themes/trends I noted. 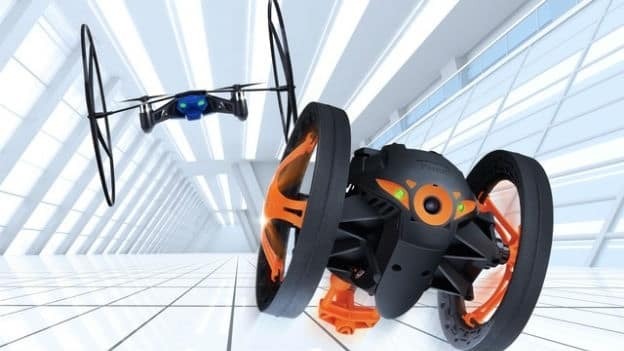 The Coming of Era of Drones - I saw barrel-rolling quad-copters and parkouring wheeled robots dancing in synchrony to hiphop music. It was awe-inspiring and terrifying at the same time. If you watch the video, I think you’ll agree the mechanisms to control drones are rapidly becoming more sophisticated. Setting aside regulatory questions, there seem to be fewer and fewer barriers to large scale drone deployments in the very near future. The Internet of Things is Going Away - The moniker, not the movement, is disappearing. Internet of Things companies don’t sell themselves as such. Instead of focusing on the tech, home security companies and wireless speaker companies and sensor companies and healh companies pitch value instead of technology. The Reinvention of the Car - BMW’s i3, an electric city car, was ubiquitous and seemed to integrate with a great many services. Google announced the Open Automobile Alliance to enable more innovation within the car. I saw self-driving cars, Toyota’s hydrogen fuel-cell concept, Audi’s new screen/dials, and Ford’s entirely solar-powered car, which they claim can recharge its batteries from the sunlight in any US city. There’s rapid innovation in the powertrain and the software/electronics of the car. Not coincidentally, these are probably the two most important axes of differentiation for car makers in the next decade. Searching for the Next Massive Hardware Market - Manufacturers are testing every permutation of device to find the next big success and releasing some Franken-devices in the process. The 10-inch consumer tablet shares the floor with a 12-inch pro-tablet. The mobile phone with camera sits next to a 21x optical zoom camera/phone. I saw tablets with keyboards and without, tablets with dual-booting operating systems, and even tablets without screens. These headless computers are little portable bricks of compute and storage that are designed to be connected and disconnected from screens at work and home. And of course, there’s the seemingly perennial SMS-enabled refrigerator or washing machine. In short, there was lots of spaghetti thrown on the walls and it’s unclear if any of the experiments will work or how large of a market any one of these niches represents. Commodification of Wearable Technology - I couldn’t tell the wearable technology products apart. Each of them report similar diagnostics. The form factors for watches, pedometers, scales and heart rate monitors aren’t distinguishable from each other. Some are differentiating on style and fashion. None of the software accompanying the devices seemed unique either. The commodification trend will continue until one of two things occurs. Either one competitor develops a proprietary sensor/analysis that resonates with the mass-market consumer, or one company amasses enough users to become the de facto social and data hub for health information. AR/VR is Back - The momentum Oculus Rift and Google Glass have mustered has created a wake of clones and adjacent experiences. One startup showed an Oculus Rift connected to a mock assault rifle and a treadmill-like walking surface. Players can run and point and shoot in Call of Duty, so the idea goes. There was quite a bit of innovation. Overall, the three areas I came away most excited about for startups are: AR/VR , drones and inside-the-car.